Up to his tragic and untimely death in Bangkok on October 10, 1968, Thomas Merton had become a living legend as a Trappist monk, intellectual, writer, poet, photographer, spiritual director, anti-war activist, and most importantly, a modern contemplative and mystic. While Merton's religious identity was clearly aligned with the Cistercian Christian order established in11th century France, he showed a spiritual affinity for the perennial truths found in many of the world's religious traditions. He was honored and widely respected for his ecumenicism. One of the principal and enduring characteristics of Merton's life and work has been the universal appeal of his spirituality. He demonstrated an ability to touch into the basic religiosity of humanity, which he believed constituted the essence of our being. His writings served as a beacon for others to search their hearts and minds for the answers to life's perennial questions about our spiritual origin and purpose, becoming fully human, love and the sanctity of life. Moreover, his own life and spirituality served as a balm for others attempting to extract meaning from the existential givens of birth, death, illness, anxiety, alienation and despair as they relate to the social phenomena of war, genocide, racism and economic injustice. While Merton has certainly been recognized as one of the intelligentsia of his era, he will be remembered not so much for his acumen as a scholar as for his charismatic capacity to reach people's hearts on the fundamental issue of becoming fully human. Over the life of his vocation Merton wrote what have become some of the most seminal and contemporary works on contemplative life. His writings (as well as his lectures to Cistercian novices) reveal the depth and breadth of his gifts as a spiritual mentor with a worldview that portrayed societies (especially developing nations) as 1) becoming increasingly materialistic, 2) overly dependent on unsustainable military/industrially based economies 3) bound to an ethic of corporate greed and 4) driven by international relations steeped in ignorance and self-interest. Merton perceived these variables, along with other theological considerations, as being primarily responsible for our own spiritual impoverishment, the ruination of the natural world, and the genesis of the false self. The global appeal of Merton's writings can be attributed, in part, to his treatment of a diverse repertoire of subjects which include: the lives of early Christian mystics, contemplation, meditation & prayer, solitude, art, psychoanalysis, the Cold War, civil rights, nuclear holocaust, Vietnam, Sufism, Buddhism, Taoism, and Mahatma Gandhi's non-violent protest of Satyagraha. Merton's intellectual and experiential grasp of the spiritual phenomena often associated with contemplative life brought him, over time, international recognition and appeal. Throughout his 28 years of monastic life Merton exerted an enormous influence on both the inner lives of individuals, as well as on the social discourse in political and spiritual communities the world over. Although he was prohibited from traveling and was obedient to the social restrictions that were part of his monastic vows, Merton received many distinguished luminaries as guests and wrote voluminous letters to others of equal and lesser renown. Perhaps Merton's most poignant message was that contemplation and contemplative life could serve as antidotes to the pain and suffering associated with our human condition. This message, among others, is his legacy to a global village seemingly poised on the threshold of physical and spiritual annihilation. Photographs copyright of the Merton Legacy Trust. Not to be used or duplicated without written permission. 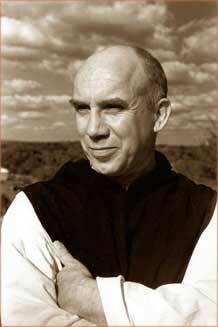 The Thomas Merton Center at Bellarmine University. All rights reserved.